GOOD MORNING my sweet & creative friends! Welcome to our 2nd day of our December sneaky peeks! Oh boy, do we have a FUN one for you today! ;) Today my AWESOME design & myself are showcasing a new set called: "Chocolate Greetings"! This SUPER FUN set has a total of 35 stamps along w/2 coordinating dies! You can do SO MUCH......the possibilities are simply endless w/this set! For my first project here today, I made a super cute topper. When I was creating this set, I just KNEW I HAD to "Peachify" my chocolate die & that is EXACTLY what I did. I think she came out SUPER CUTE! For my topper I used my "XL Label Die" & my "Stitched XL Label Die". The sentiment and flag banner are also included in this fabulous new set! 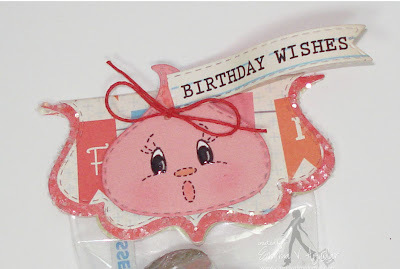 For my next project (which I just LOVE) I make a cute party favor using my "Bubblegum Treat Box". 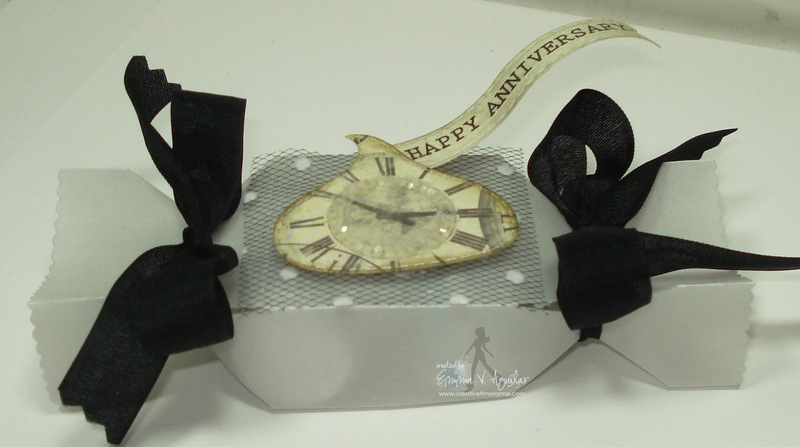 I got an email from someone who needed a QUICK idea for an anniversary party favor for 20 people & I came up with this! This is why I LOVE my products because you can make something so PERFECT & Classy looking in no time at all! ~then added the chocolate die w/the coordinating flag banner die! This was seriously "effortless", but look how pretty it came out! Now onto my last project! I couldn't be done unless I made a Valentine item for you today! I decided to make a 3x6 card (which I love this size) for you. I thought it would be cute to use my new dies & just add 3 chocolate kisses going up & down w/some Valentine messages! Again, a VERY SIMPLE, but CUTE card that was put together in no time at all. The 3 sentiments you see here are including in this set as well! I used my sewing machine to adhere my blue layer of paper onto my red cardstock. You have done it again, Emma! I love the kisses, so adorable! You just keeps doing your self! You should be every proud! OMG Emma you are so fantastic at what you do I just am lovin' everything and todays crafts are sure awesome gosh girl you keep outdoing yourself and you are so thoughtful to actually read all of your comments and then so quickly create a masterpiece per a request you are one terrific gal. Thanks so much for all you do it makes my day. Now I have to let my fingers do the walkin' and head on over to your DT array of craftiness and I know you'll be hearing a lot of OOOOOH's and AAAAAAH's from me so here I go! This peek just keeps getting better everyday. I love this collection and the projects are beautiful. Great job! Chocolate...my favorite thing...Love the candy card the best. What a great set! It will make some fun treat gifts for all sorts of occasions! Awesome! I love the "kiss". You did it again Emma, love all your projects. Those kisses are so darn cute. The Design Team's projects are all so awesome. So much inspiration. As always, whatever you create is absolutely beautiful! I want the entire set. I just love love the kisses. It looks to darn cute. Great job and cant wait to get my hands on this set. These are AWESOME Emma!! What a cute cute stamp and die set!!! I am so looking forward to this release!!!! Another FAB day of sneaks!!!! Love the kisses, love the projects, love the entire release so far! You and your DT have outdone yourselves yet again - and I know there's more to come. Thank you so so so much for sharing your creative genius with us!! I'm loving playing with the kiss die, and your projects are just too cute, Emma!!! The face on the kiss just cracks me up! Love this set I can't wait to see it in full!!!! 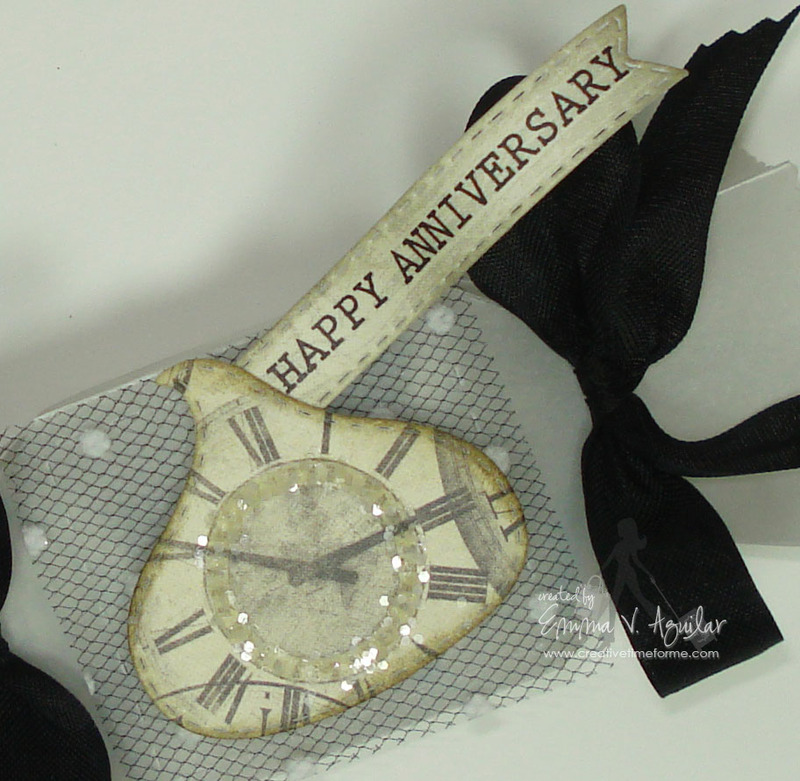 This kiss die can really go with any occasion with these perfect coordinating stamps. Just when you think you have seen the cutest stuff ever, you come out with more! Can't wait to see this entire set! Adorable projects! OMG! You definitely sold me on this set!! Can't wait til Monday!! WOW! These look AWESOME!!! What fun projects with them too!!! oh my goodness... i seriously love those little kisses!!!! Mmmmmmmmmmmmm you can never go wrong with chocolate kisses and then the paper ones are so sweet!!!! I just bought some Christmas Kisses at 75% off knowing I need the green ones for St Paddys' Day, The red for VD and always use the silver. Great job!!! oh my! don't really know what to say except these are awesome! I look forward to your releases and I can't wait to get these dies!! and the stamps too! LOL love the glitter on them all too. Super adorable. I love everything I see!!! I just love Hersey kisses. This is a great idea. Love the stamps and dies. I can see how many diffent projects the DT has come up with. Be back tomorrow. 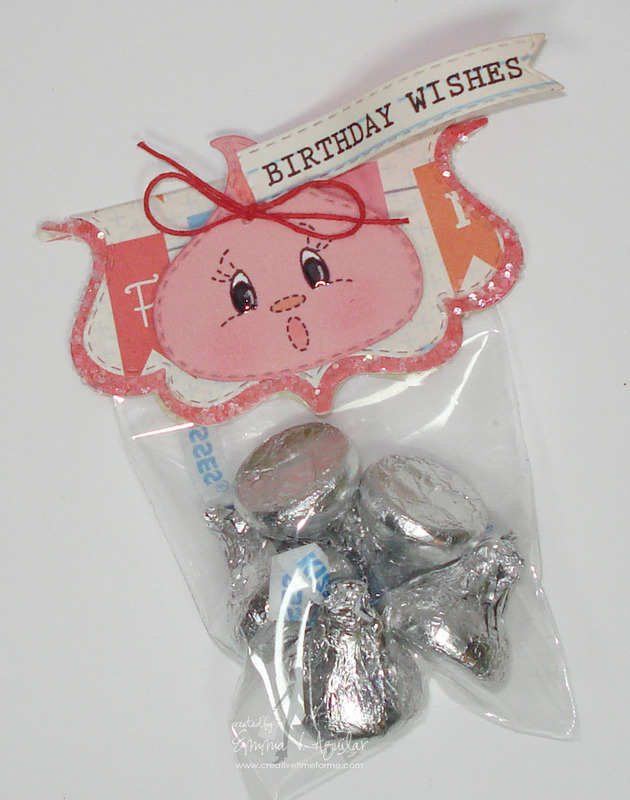 Love this set--who doesn't love Hershey kisses! So cute!!!!! Love the die and stamp set!! Great job! Such an adorable kisses' set! Great to have a matching die with it! You have out done yourself again... Love! Oh my goodness!! As always, I want it all!!!! Everything is so super cute and I am super excited because I heard the word sale -- one of my favorite words!! Oooo Emma this set is a got-to-have!!! I ♥ all the projects you did, love the chunky glitter!!! Loved your video and all the projects from your designers, can't wait till tomorrow! Love your projects Emma, this set looks adorable!! Super cute set! Can't wait for your release! 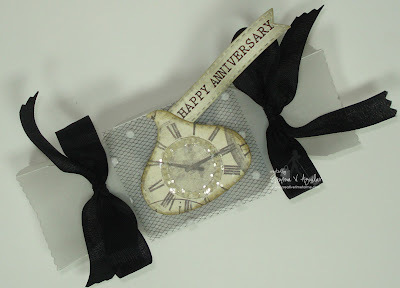 All these are great - I love the chocolate kisses card! You did it again!!! am enjoying all of your sneaky peeks and the amazing projects. Can't wait to see your entire release! Looks great Emma! I can see this will be another super release! Awesome love love love the kiss die. Can't wait to get this new release. This release is amazing Emma....love it and ca't wait to purchase! Oh Miss Emma ~ EVERYTHING you did again is just BEAUTIFUL!!! I LOVE how you did the X's and O's glittery ~ nice touch! I LOVE how versitale this release is ~ so many wonderful ideas floating through my head! Again the DT's did such a AWESOME job!!! I also must agree about Liz's boutique too! you are amazing! you always come up with the cutest projects! it must be the late nights that keep you creative! lol! Love your projects. Can't wait to get the new release. You have done it again. Great job. Loved all your projects...my favorite...the anniversary treat box!! Oh my gosh I know this set is going to be mine!!!! LOL "BE Mine" hahaha!! moment it is in store!! So sweet. love what you ALL have shown just how diverse these stamps can be. Thanks for sharing all the talent with us. Emma this release is too CUTE! !LOVE!LOVE!LOVE!The BEST EVER!! Loving this new release. Thank you. Happy New Year to All! OMG! Your projects are the CUTEST! You always inspire me :). Thanks for sharing! Another wonderful creation.Chocolate Kisses looks amazing. Keep up the inspirational work. Zoe fromAustralia. These are adorable!! Love the "kiss" die!! Hi Emma, beautiful cards, thanks for all your ideas and you DT is doing a great job. How absolutely adorable, each and every project. I can see how versatile this set is going to be looking at the DT projects. Great release!! All of the Dt did an amazing job! Great job Emma! I want this whole release! You and your DT team are amazing! Kisses, hearts, swoon! I love everything I'm seeing! Awesome!!!!!! Can't wait to get these!!!! I am in love, love, love with your latest release!!! :) Way too cute!!!!!!! Thanks so much for sharing and for the chance to win! I am just in love with these cute little kisses:) Adorable!!!! Wonderful projects! Just this week I was wishing I had a Hershey's kiss die and here it is! I think I NEED this new set; I can't wait to see all of it! TFS and thanks for the chance to win! Wow, hard to know what you like better between yesterday and today. I love Hershey kisses anyway and now a die for them. To cute. Wow! I'm very excited about this set. Love the chocolate die. Can't wait to see the full set. This die is just so cute!! I love all the cute little cards you made with it!! Makes me want to go have some Hershey kissesa!! What cute projects, as usual. Love that hershey kiss die..........makes me want some chocolate! Those kisses re just the cutest! I cant wait to see everything! Great job everyone you are the best team! I am just loving those kisses! I so enjoy your Design Team's craftiness. They are amazing. This is so cute, can't wait to see the whole set. You just fall in love easily with your product, that is why you say you "love, love, love" your latest set. It is hard not to fall in love with your designs, I want them all! I also love these new dies !! I just got a Big Shot ...so I need to start buying dies ! I know where to start . These are all so fabulous ! TFS . I'm loving the chocolate kiss. Great new release. Love your new set. Can't wait to get it! Great project ideas..thanks so much! Love the cute glittered clock on the yummy treat. Great projects. I can't wait to get the Hershetpy's chocolate shaped die- so yummiest cute! Great video! I love the little kiss dies!!! and I love that I can use the XL Large die for treat bags. I just need smaller bags!Lol. Love the new sneeky peaks for the release. Great job with all the projects. I am looking forward to 8:00 tomorrow!! Can't wait to order! Gorgeous. I can't wait to see all these sets for sale.